Ready to play Laser Tag? Just like online gaming, but play for real at Xtreme Combat! 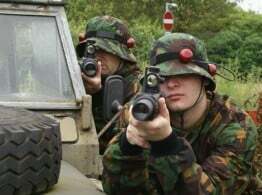 Listen to the mission briefing, familiarise yourself with your MP5 weapon, discuss tactics with your team then GO, GO, GO!!!! Take aim through your red-dot sight, pull the trigger and target your opponents at up to 550 rounds per minute! Its painless, with the guns firing infra-red beams detected by sensors you wear, and with no costly ammo refills you can really get into the missions without worrying about getting hurt or the cost! 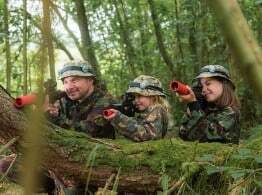 Xtreme Combat Falkirk – A 5 acre woodland zone, providing lots of natural cover and mission options! The ultimate woodland combat zone! Xtreme Combat Edinburgh is located in a purpose built combat arena beside Xtreme Karting in Newbridge, Edinburgh, and shares the same 5 star rated facilities! A purpose built outdoor combat arena, featuring mock buildings, barricades, sand bags, army land rovers etc for cover! Both our Combat venues in Edinburgh and Falkirk are within easy travelling distance from Edinburgh, Livingston, Glasgow, Stirling, Fife (pretty much across all of Central Scotland!). 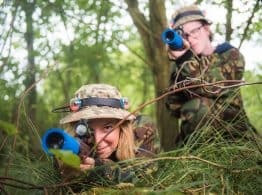 We aim to offer you the chance to experience the fun and adrenaline of laser tag at its best in Scotland! 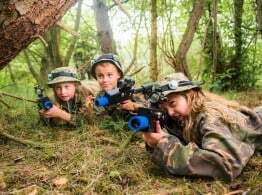 Laser Tag Falkirk – Now OPEN!